Throughout my university days, the seminar rooms gradually changed over the years. It seemed like they were becoming more colourful with less desks and chairs. Going from desks and chairs to table tablets attached to chairs to eventually having bean bags! There is no denying the comfort of the bean bags whilst learning about “Colonial Literature” texts and despite being situated in what seemed to be a more casual environment, I seemed to take the information in a lot more! 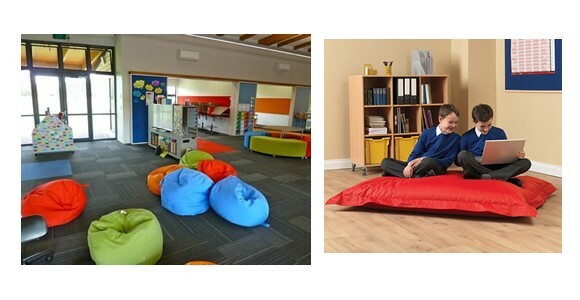 The increasing use of technology in schools has encouraged the education sector to implement breakout areas, utilising the already referenced bean bags, into schools. iPads and laptops are replacing the notepad and pen and there are also many other advantages to bean bags in schools. The use of bean bags, in primary schools especially, is rapidly increasing in the UK. The benefits that are granted by the versatile furniture objects are encouraged for our younger generation and studies have shown a lot of improvement in growth and progress. Studies have recently proved that ergonomics play a huge part in pupils’ concentration spans and efficiency levels. Discomfort that can be caused by wooden or plastic seating will create a distraction. Preventing the young pupils from fidgeting, a bean bag can be moulded into a comfortable position and the bead filling provides extra support for the body. The support given is very beneficial for the growth of their young bones and muscles as they proceed to grow. Eliminating the restlessness caused by discomfort will mean that the students are able to concentrate more, focussing all their attention on the lesson. The benefits of using bean bags in reading areas can’t be overlooked either. The bright colours create a fun experience for them and enhances concentration levels as well as increasing motivation. A modernised area is created for them, replacing a restricting traditional one. With the bean bags being so versatile, they can also be moved if the pupils would like to be in a quieter space to read on their own. Working as a team is also encouraged with the use of bean bags. Learning to read can be daunting and quite stressful. Having the freedom that’s created by bean bags will encourage young pupils to work together, surrounding themselves with help and support from their fellow classmates. Flexibility is another important advantage of having this furniture choice in the classroom. The room can be “extended” thanks to them being lightweight, meaning that the class can be moved to the outdoors or a different room without having to carry heavy furniture around. Outdoor learning can be encouraged as a lot of the bean bags are suitable for outdoor use and several activities for a PE lesson can also be planned where bean bags are utilised. It is incredible to know that something as simple as a bean bag van help improve the learning experience for our younger generation to such a high level. Concentration levels are increasing, encouraging better progress and ergonomically the bean bags create better posture and comfort. They are unsurprisingly becoming fast becoming a “must-have” for classroom environments.